If all goes to plan, this will be the first installment in a regular blog feature about two of my favorite things, craft beer and metal, considered singly and in combination. Two great tastes, et cetera. I'm going to start with a beer that's kinda metal. I'll explain how in a bit. 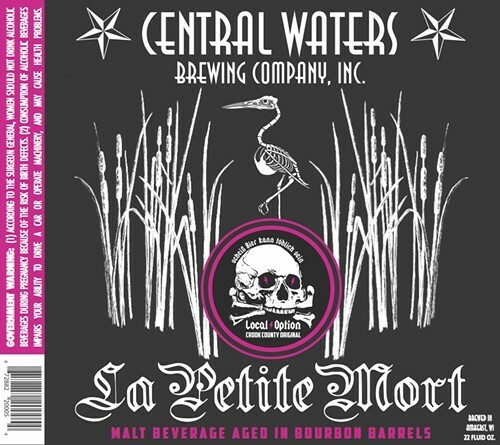 La Petite Mort is the first collaboration by Central Waters of Amherst, Wisconsin. Working with dedicated nerds from the Bierwerker program of Chicago bar Local Option, they brewed the inaugural batch in November 2011 and released some of it unaged on draft in January; the bourbon-barrel version, which spent three months in Heaven Hill whiskey casks, came out in late May on draft and in late August in 22-ounce bottles. It didn't hang around long either time, and as far as anyone at Local Option knows, the only way to get it in Chicago now is in bottles at the bar. A second batch, brewed in late September, is on the way in a few months—this time they're just going to get down to business and barrel-age the whole thing. 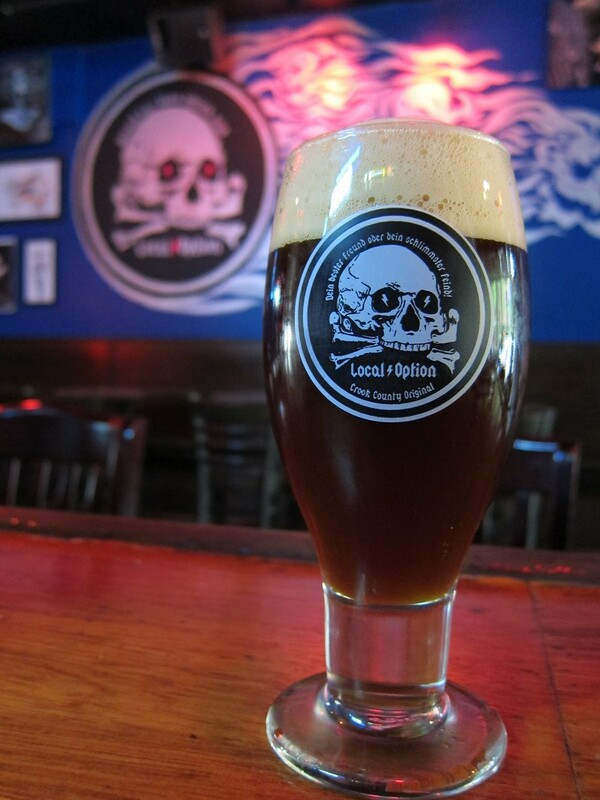 Loosely speaking, La Petite Mort is a strong dark German-style wheat ale called a weizenbock—sort of an amped-up dunkelweizen, in case that helps (they're usually cloudy with yeast, with lots of malt character and no conspicuous hop flavor, and they often smell a bit like cloves and bananas). Central Waters and Local Option departed from orthodoxy by abandoning the usual weizenbier yeast, which Local Option brewer Noah Hopkins thought would clash with the bourbon flavor from the barrels. (Central Waters co-owner Anello Mollica had proposed at the get-go that the beer be barrel-aged, since his brewery has one of the largest barrel operations in the midwest.) They ended up using 50 percent neutral ale yeast—meaning it doesn't impart a significant flavor of its own—and 50 percent Belgian yeast, after experimenting with three Belgian strains to determine which would best complement the bourbon. Hopkins says it was "one of the most fun yet challenging beers to make." Well, as per usual for the style, it's definitely cloudy, and it's the color of dark milk chocolate. As is common with barrel-aged beers, it doesn't foam prodigiously or hold much of a head, though it certainly doesn't feel flat once you take a sip. It smells like bourbon, of course, but also like banana bread. Maybe banana bread with chocolate chips in it. I'm also getting a little toffee. The flavor is heavy on caramel malts, with oaky vanilla, toasted nuts, touches of butterscotch and coconut, and lingering whiskey that gives the aftertaste a pleasantly dry tannic sting. The beer feels a little thin, given that it tastes so rich you'd figure you could stand a spoon up in it. As it warms I can pick up some fruitiness from the Belgian yeast—not just banana but also peach—and some bittersweet chocolate. Local Option put their own tongue-in-cheek spin on that design, in keeping with the bar's roguish personality. First, the label is black (metal! ), and second, the heron is a skeleton (also metal!). An early mockup used a stock image of an ostrich skeleton, but the Local Option guys decided they could do better. They sent their go-to illustrator, Jon Scordato, to the Field Museum to make some sketches of a heron skeleton in the permanent collection. I love it when folks go the extra mile to make a pointless joke. Thanks to Noah at Local Option, and also to "brand ambassador" Alexi Front and owner Tony Russomanno, who comped me a bottle of barrel-aged La Petite Mort to review at home the last time I stopped in for a few beers. I'm not sure that needs disclosing, since most music reviewers don't bother to point out when they get a free promo copy of a record they're writing about. But it feels a little different with beer, so there you go. This fruity Belgian-style saison is one of 31 beautiful beers the Local Option will be pouring all night.